2. Biography in Context: a good reference source for information on the people in the French Revolution. Next, search for websites. Be sure to assess the quality and credibility of websites that you find online. A website written and curated by scholars from George Mason University and City University in New York. You will be using a number of pictures and images in your project. You can use images from the encyclopedias or databases, or do a Google image search. Search "Tennis Court Oath" in Google. Remember that each image should have a caption and an indication of the source at the bottom of the picture. 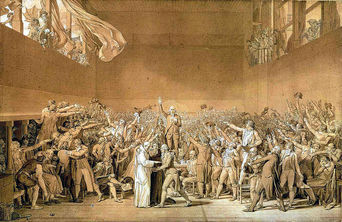 ​ Tennis Court Oath by David Jacques-Louis. Wikimedia Commons. One of the components of your newspaper is ONE political cartoon. Before you begin to draw, watch the video of Patrick Chappatte, an editorial cartoonist for The International New York Times as he shares how he makes an editorial cartoon on deadline, and offer students advice on how to make a cartoon. Take note on the process of making a cartoon, and what advice Mr. Chappatte gives to students making their own cartoons. Next, complete Handout 7: Drawing a Political Cartoon.